armour | "A Stitch in Time"
Emanuel picked a real tough one this time! Apparently the Nodosaurus is a sneaky dinosaur, not only is it only in North America but only two incomplete skeletons have been found and those AGES ago. Although THREE places are listed when you read up on it. As well, no skulls found! Add to that VERY few images and the fact that more than a couple of my new favourite dino websites did NOT cover this dinosaur and it was rather slim pickings. Even with these difficulties I DO have some information to share as well as a video. Don’t get me wrong, it is a VERY simple video, just two girls reading info about the dinosaur but Emanuel was excited to have something to watch however brief! Now onto the nitty gritty… the links for the (limited) information we found. About.com had a little blurb in their herbivorous dinosaurs section right HERE. I rather preferred this site’s chapter format with basically an honest – we really don’t know much – HERE. Wiki had a short article HERE. And as usual, EnchantedLearning had something HERE (I REALLY miss my subscription with all those print out privileges!!!). Coloringpages101 had the best image for colouring HERE. 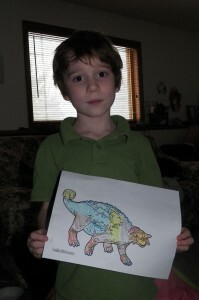 Emanuel was rather impressed by the pattern the armour on this dinosaur. 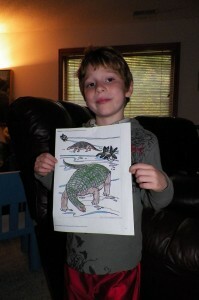 KidsDinos.com had something for us under their Cretaceous period list HERE. This plant eating 4 legged (5 toed??) dinosaur was often compared to a hedgehog in the literature due to its inability to fight back (no club on tail) and rather hunched down and did the hedgehog thing – no soft bits exposed. I had to make Emanuel his own fact page and we printed out the skeleton image on the Wiki article.